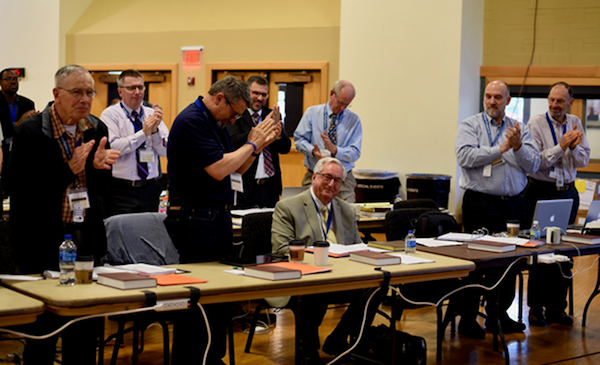 At the 85th General Assembly held this June, General Secretary John Shaw expressed the thanks of the Home Missions Committee for the 33 years of service by Mr. Hilbelink. The Assembly gave Mr. Hilbelink a standing ovation. It is right to take a minute to thank God for the labors of John Hilbelink. He is a gift from Christ to his church, and he has been a gift to the CHMCE and to the home missions labors of the OPC. A few details are worth noting about his time of service on the Committee: John was first elected to the Committee on Home Missions and Church Extension (CHMCE) at the 52nd GA in 1985 and has served without interruption since. The Committee so appreciated his service that he was elected VP in 1986, and served in that capacity until 1991. At that point, he was elected President of the Committee in 1991, and has served in that capacity until the present day. During that time, he has provided a steady hand and a gentle, humble, but commanding presence to guide the Committee through our work. John, you will be deeply missed by the Committee, but we praise God for you and your 33 years of service to the GA through your work on the CHMCE, and we pray for the Lord’s continued blessings on you, your dear wife Lois, your church in Rockford, and your continued service to Christ and his church.